Plainspoken Coffee. A Coffee Review for Ordinary People by Ordinary People, #41. The Arbor Day Foundation‘s mission is to “inspire people to plant, nurture, and celebrate trees.” The first tree-planting holiday, dubbed Arbor Day, took place in Nebraska in 1872. The last Friday in April — today — is National Arbor Day in the United States, celebrated with various tree planting activities. One of the Arbor Day Foundation’s projects is Rain Forest Rescue, which has supported development of a conservation plan and land purchases in forested areas of Mexico, Belize, and Guatemala. Related to that effort, the organization sells Arbor Day Specialty coffee. In addition to bags ranging from ten ounces to five pounds, various samplers and gift boxes and a coffee club of two bags of coffee a month are also available. The regular offerings are the Arbor Day blend (medium roast), an Italian dark roast, and two flavored varieties (hazelnut and a cinnamon hazelnut). 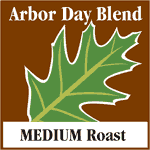 The medium roast Arbor Day blend is also available in decaf through the coffee club. There is currently a limited edition Colombian from Mesa de los Santos which I won’t go into here; I wrote about this Smithsonian Bird-Friendly and Rainforest Alliance certified origin in a previous post. Aside from the limited edition coffee, there is no further information about the the origins of the Arbor Day selections on the web site. However, I was told that Arbor Day sources from Fair Trade co-ops in Mexico depending on availability: ISMAM and Nubes de Oro. ISMAM (Indigenas de la Sierra Madre de Motozintla) is a cooperative with nearly 2,000 members of Mayan heritage, growing coffee on 9,700 ha of land, mostly on plots of less than 5 ha. It is based in Tapachula, Chiapas, near the Guatemalan border, and all members have received organic certification. Coffee is grown between 800 and 1600 meters (other sources I’ve seen give the altitude at 1,100 meters; the lowest elevations are robusta coffee, not included in this blend), and is the arabica varieties typica and bourbon. ISMAM-grown coffee is touted as shade grown. One larger ISMAM farm, the 200 ha Finca Belen, is Smithsonian Bird-Friendly certified. It’s a farm where Smithsonian researchers have done a number of studies on shade coffee and biodiversity. It’s not possible to determine how much, if any, of the Arbor Day coffee comes from this particular farm. Shade management across 2,000 farms will certainly vary. Nubes de Oro is also a Chiapas cooperative, located near the El Triunfo Biosphere reserve (see this Starbucks review for more info) and headquartered in Mapastepec. There are over 400 members. As with ISMAM, Nubes de Oro grows typica and bourbon, and the altitude ranges from 900 to 1300 meters. This cooperative is also listed as Smithsonian Bird-Friendly certified, although the certification may involve only some of the members. The Arbor Day coffees are roasted by The Roasterie in Kansas City — a really good specialty roaster, not some big anonymous commercial roaster, which I think is great. We reviewed the Arbor Day Blend in both regular and decaf. When I received the coffee, the Fair Trade certified label was prominently displayed, but I had to search for the organic seal. Curious. Anyway, as advertised this was a medium roast, with most beans showing a sheen of oil, and some with blobs of oil. There was no roast date on the package (which was not a valve bag), but when hot water hit the freshly ground coffee it did have a decent bloom. In the French press, this coffee was pleasant, but did not have the acidity we may have expected from a Mexican coffee, especially from Chiapas. Some chocolate notes were there, but more people commented on flavors tending toward nutty or earthy. Several people thought it was sharp, slightly bitter, or better with milk. Brewed, this harshness was gone for the most part, but it was still not as lively as we would have liked. To be fair, this is in all likelihood, given the season, the end of last year’s crop and therefore would be more apt to be a little dull. One taster said that it didn’t knock his socks off (actually, I think he said “my socks stayed on when I tried it.”). But, he said that didn’t mean it was bad — just a decent cup of coffee. It was just what you’d expect from this origin, balanced, not really complex, a good everyday cup. I don’t drink much decaf, so I wasn’t sure what to expect from the decaf version. I thought it was better than the regular — a little smoother, without the sharp notes, even in the French press. It had no “off” taste, but was a little weaker than the regular, even when we experimented with grind and brew times. Had I been served this, I would not have known it was decaf. Overall, these coffees scored 2.75 motmots. For those seeking decently-sourced, organic, Fair Trade, and generally shade grown coffee — especially by subscription — I’d say to certainly give the Arbor Day coffees a try. In particular I think the average American coffee drinker, who is used to darker roasts or coffee shop coffees, would be pretty pleased with this. And on this Arbor Day, consider planting some trees. If you order from the Arbor Day Foundation, you will be directed to select trees that will grow in your region. I implore you to make sure to select species that are native to your area. Arbor Day sells a lot of species that are not native to North America, including a few that are considered invasive in some regions. Using native species is really important to keep ecosystems functioning normally — and it will help the same migratory birds than benefit from your choice of shade grown coffee! Arbor Day is different in the Nation's Capital. Quick: what's the official tree of DC? Plant a tree. Support local beavers.